Last year the iconic early instrument group La Petite Bande, founded and led by violinist Sigiswald Kuijken, had its long-standing subsidy from the Belgian government revoked, apparently shortly after this disc was recorded. One should make no connections here, however, since the concept of “classical” music, particularly period instrument performances, seems to have been under siege by a number of European governments of late. One might engage in a comment of the politics of the matter, though of course here is not the appropriate place. Rather, to have a disc of this quality recorded before and released following such a monumental decision should not pass without notice, at the very least. 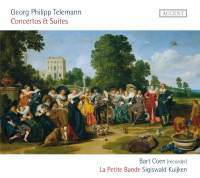 That being said, this recording brings four pieces that are probably some of the best known and widely available works of the prolific Georg Philipp Telemann. The Suite in A Minor is about as iconic a work as one might wish for, given that I’ve found no fewer than about two dozen recordings (and this is probably just the tip of the iceberg). It demonstrates the composer’s remarkable ability to combine a rather virtuoso solo instrument with the Baroque suite to his well-known interest in “foreign” musical material, in a manner that provides interesting music. For instance, the second movement, “Les Plaisirs,” is almost a French peasant dance with a wind line in the trio section that seems to have no possible moment for the flautist to breath. The following “Italian” air is an instrumental excerpt from an opera seria in its poignancy, and the entire suite ends with a somewhat pompous polonaise, a result of Telemann’s years in Silesia. The companion piece, which features a solo viola da gamba, has a second movement that seems like a military march, and indeed is entitled “La trompette.” Here, the gamba has a darker trio section accompanied only by a violone, giving the central section a duet chamber sound. The final Gigue is a joyous dance, into which the solo gamba inserts its presence like a dancer standing on the sidelines, commenting upon the main action. As one has often noticed, Telemann, like Antonio Vivaldi, loved to write concertos that featured several solo instruments as a means of contrasting their timbres. While there is a certain formulaic structure to most of these, the real interest lies in how he uses the soloists. In the A-Minor Concerto the solo recorder and gamba form a nicely resonant duo whose tones are quite evenly matched. The third movement, marked dolce, has a calm pastoral quality that makes both instruments sound like a pair of cooing lovers. The G-Major Concerto for recorder and oboe, with a violin ripieno, is more along the lines of a traditional concerto grosso, with some nice imitative passages in the final movement and—unusually enough, with a gigue for a first movement—the main theme in the violin and parallel commentary in the woodwinds. As one might expect from a group as experienced as La Petite Band, the performance is uniformly excellent, with fine intonation, well-nuanced phrasing, and a wonderful sense of ensemble. Though Telemann often alternates between the transverse flute and recorder (called “flauto”), here the playing by recorder player Bart Coen provides a good indication that the latter was more to Telemann’s taste in these works. What I like about this too is the fact that the continuo is more discrete, with the harpsichord remaining tastefully in the background. In short, though all of these works are available elsewhere, this is a fine disc and should provide the representative exemplar of the pieces. It demonstrates that as long-lasting a group as La Petite Bande can still be a leader in the field, and it is hoped that the Belgian powers that be will eventually see the errors of their ways. Such a group who can produce recordings of this quality deserves continued support.